The Memory Palace is a refuge for North American extinct birds, including Passenger Pigeons, Carolina Parakeets, Great Auks and Ivory-Billed Woodpeckers. Actual extinct birds inhabit the Palace, living in luxurious rooms, just as though they were still alive. Although they will never leave, they can look out their windows at the Palace’s beautiful gardens and skies. They take comfort in being with other members of their extinct species. The Memory Palace is the world headquarters of the International Cross-Species Memory Project (CSMP), which has an extensive collection of oral histories of the extinct birds of North America. The Palace also houses the first Interdisciplinary Center for Avian Pre-extinction and De-extinction Studies (ICAPDS). ICAPDS was established to protect birds that are on the verge of extinction (pre-extinction), and to restore extinct species from their DNA (de-extinction). The Euterpe Research Library is located in the West Wing of the Palace. It contains over 500,000 books, journals, photographs, videos, and films about birds. Its collection of over 25,000 birdsong recordings is available to the public on its website, http://memorypalace.us. 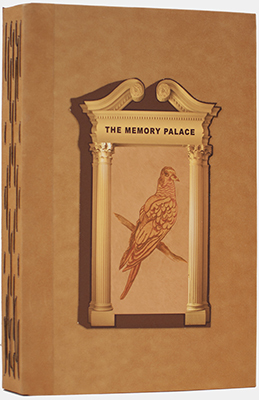 The Memory Palace is described in detail in the artist's book by Barbara Milman. The book includes images and interviews with some of the extinct birds, as well as other information about the Palace. Click on the cover of the book to look inside. For more information about the artist go to barbaramilman.com. Copyright 2017 by Barbara Milman. All rights reserved.